Jowar, also known as pearl millet, is gaining tremendous importance due to its health benefits. We commonly consume jowar in the form of rotis. Try these different, yet very simple recipes. These recipes are rich in fibre, protein, iron, calcium and antioxidants as they have jowar as a main ingredient. • Sauté curry leaves and dry red chillies in oil. • Add popped Jowar, salt and groundnuts. This snack can be stored in airtight container for about 3-4 days. • With sufficient water, bring jaggery to boil and make it into thick syrup. • Crush the popped Jowar coarsely. • Add crushed almonds and Jowar into the jaggery syrup. • Mix well and shape into Laddus. 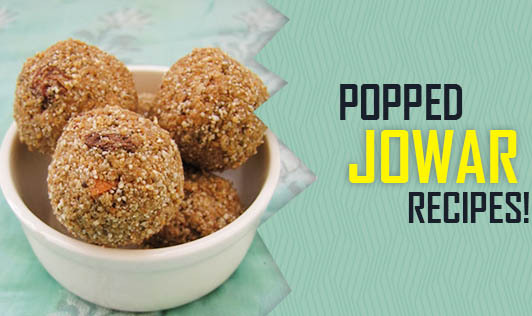 • Mix all the ingredients and enjoy your popped jowar breakfast cereal.